countries across the globe since 2008 as modes of transportation for people and goods. Erratic weather conditions prompted manycountries to introduce this eco-friendly vehicle because they pollute neither air nor sound; in fact, they contribute to better weather condition. These vehicles help to carry passengers within the city, especially to travel a short distance. In the world where countries need to shell a lot of money, buying fuel should replace public transport with these e-rickshaws to reduce fuel expenses to some extent. In India, these e-rickshaws began to gain popularity since 2011. Since the time of its inception, people started showing much interest in travelling in these electric rickshaws because of its low cost. In cities of India like Delhi, you will see lots of e-rickshaws are moving in cities and the numbers are increasing day by day. Also, Ola cabs has now introduced e-rickshaw in Delhi as part of ‘Stand-Up India’ initiative. The transport aggregator launched the ‘e-rickshaw’ category on its app in Delhi-NCR. According to a statement from the company, Ola would be launching close to 5,100 e-rickshaws, in partnership with Bhartiya Micro Credit (BMC). These rickshaws will be deployed across Delhi, Gurgaon, Ghaziabad, Noida and Faridabad. Big cities in India are currently struggling with pollution and the government is taking strong measure to overcome this by introducing new rules and regulation for diesel vehicle. With current scenario we can predict that in near future e-rickshaws are going to be preferable mode of public transportation and it is going to replace fuel operated rickshaws. As we all know that the demand of e-rickshaw is growing rapidly in Delhi and other cities. Even, people in small cities in India are prefering e-rickshaws for travelling. Eco-Friendly: Since this vehicle runs on electricity, it can never emit smoke. This way one can travel across the city without polluting the air. Batteries used in these vehicles can be recycled and can be disposed of without any problem. Less Expensive: This e-rickshaw can be easily afforded by a middle class person who cannot shell out much money. No doubt, these vehicles are very economical for both passengers and drivers. No Sound Pollution: This e-rickshaw produce less noise compared to vehicles which run on petrol and diesel. Since entire engine of this e-rickshaw runs with the electricity of the battery attached to the vehicle which results in less noise. Maintenance: Since this vehicle has no engine, and gearbox maintenance of this vehicles comes very cheap. It’s very easy to charge the battery. All you need to do is, pay money for charging the battery. Safety: E-rickshaw involves less risk compared to auto rickshaw which runs with fuel. They cause fewer accidents. Fare and Cost of Vehicle: This e-rickshaw are affordable to buy, one can buy this vehicle at the price of a bike in India. One can buy this e-rickshaw at a price of 95,000Rs. When it comes to motor rickshaw you need to spend 2 lakhs of rupees, which is too expensive. E-rickshaw drivers charge Rs 10.00 for a distance between 2Km to 5Km. Motor rickshaw drivers charge Rs 25 for first 2Km and Rs 8 for each additional kilometer. E-rickshaw uses 4 batteries, which can last for six months. New batteries cost Rs 25,000. Full charged battery can help the driver to travel a distance of 80Km. 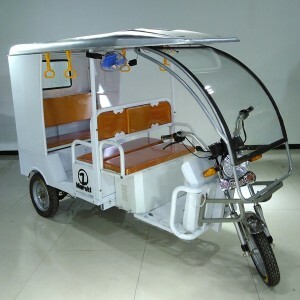 You could step into e-rickshaw manufacturing business and could make profits as a supplier in India. Rickshaw manufacturing companies are growing at a rapid phase; this is because of the demand for this vehicle. Since government is encouraging with loans for lesser interest rate, small entrepreneurs are showing much interest in buying this e-rickshaw. Even these e-rickshaw manufacturing companies are coming up with innovative ways to attract consumers. This eco-friendly vehicles are much needed for put a halt for growing air and sound pollution. With growing demand, manufacturing companies are planning to meet demand at any cost. E-rickshaw manufacturing companies are contributing for better weather conditions across the country.